We are proud to announce our premium range Naturo will be increasing its offering in ASDA stores across the UK from February 2019. Already available in almost 400 stores, the Naturo 400-gram tray will now be stocked in an additional 130 stores, while the Naturo variety pack canned food will be launched into 350 stores, a first for the retailer. This latest announcement builds on the growing presence of our Naturo brand in the UK, which has generated multi-million pound sales in 2018 alone. 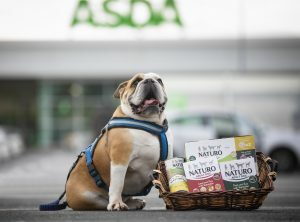 The market growth in the UK is reflective of changing attitudes to maintaining the health and well being of pets, with many pet owners switching from other brands to natural food. Since we launched Naturo in 2013, the range has increased from 4 varieties to 33, a result of constant innovation and development in response to our customer feedback and market trends. Asda launched Naturo in selected stores in May 2018 and now stocks eight products, including ‘Grain Free’ Trays and variety packs. “The successful expansion of the Naturo range across Asda’s store network demonstrates our commitment as a retailer to stock the very best Northern Ireland products on shelves throughout the UK.